A skunk on a warm day in early February in Morgan County. Photo by Amran Ahmad. During one of our recent warm spells, I noticed several skunks had not survived their attempts to cross the road. There is a reason you see skunks more often during unusually warm winter days: skunks do not go into a deep sleep hibernation. Instead they “cat nap” or go into a torpid state. Torpor is defined as sluggish inactivity, lethargy, or dormancy. This state of suspended physical powers is driven in part by temperature and food availability. To survive winter, skunks hole up in a den and let their breathing rate and body temperature drop. On warm days they wake up and search for food. But a discombobulated skunk that just woke from a nap often meets its demise via vehicle. 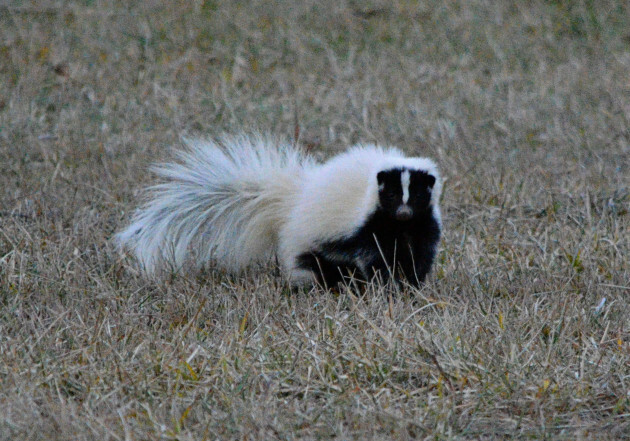 This skunk met an untimely end on a warm day in February. Photo by Shane Gibson. Another reason you see more dead skunks on the road in late winter is that they breed in February and March. Adult males are extremely active during this period, so there’s a greater chance they’ll become roadkill. By the way, skunks are solitary creatures except for during this brief mating season. Anther interesting fact about skunks? 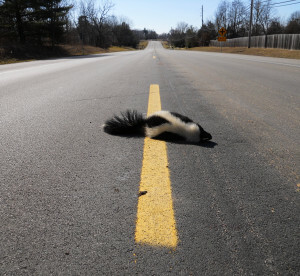 Their Latin name—Mephitis mephitis—means “noxious vapor.” When a groggy skunk doesn’t make it to the other side of the road, you sure don’t have to see it to know what happened!